I know the calendar says April, but I think someone forgot to tell the weather because we just got snow the other day. Therefore, mentally, I still feel like it's January. 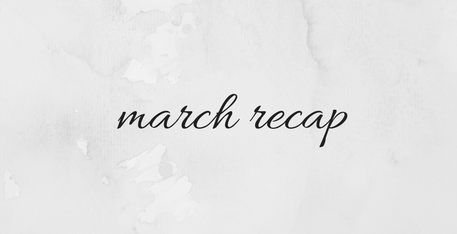 I was truly shocked when I realized April was starting and it was time for me to review and reset my goals for another month. We are officially one quarter through 2018! How are you doing with your New Year's goals/resolutions/themes? If they feel like a distant memory, it may be time to start fresh. The freshness and new life of Spring can really help to reset our minds and bodies (if it ever does arrive). I'm hoping to do just that with my April goals! one. wake up earlier- I was about to call this one a complete failure, but I'm going to try and give myself a little credit. On average, I am waking up earlier than I was a month ago. Before March, I was rushing out of my apartment every morning because I was sleeping too late. Now, I'm not rushing as much! But in my head, I wanted to start getting up an hour before I normally do, which was pretty unrealistic looking back. I'm revising this goal for April! two. complete five workouts- I did one workout :) You win some, you lose some, right? three. relearn to parallel park- I subjected myself to the embarrassment of a 24 year old practicing her parking in front of her parents' house to complete this one. But I did it! I even got a chance to practice once parking downtown. There was a ton of space and it took me a little while, but I conquered the fear! Now I just have to make sure I keep practicing so I don't lose it again. one. complete three workouts- Because of my rehearsal schedule, this is the maximum I'm going to commit to this month. Hopefully I can even surpass it! two. wake up by 6:30 AM on week days- This is the revise to my March goal. I realized that I needed it to be more specific than just "wake up earlier". I would say right now I'm up by 6:45 most mornings, so hopefully 15 minutes is a little more realistic. three. read a devotion every morning- What will I do with my 15 extra minutes? Here's my answer. The devotions I use actually take about 1 minute to read, so I really have no excuse! I'm on and off with this habit right now, but I want to solidify it as part of my morning routine this month. four. try a new restaurant/coffee shop/bar in my neighborhood- I live in a neighborhood of Milwaukee that is filled with great places to eat and drink and I've been to very few of them. In an effort to get to know the area better, I want to try one new place this month. Once the warmer months arrive, I look forward to exploring even more! What goals and plans do you have for April?